Inscribed (probably signed) in oil paint verso: A N Pinxit, subsequently modified in ink to read: Sir Hy Raeburn/A Nasmyth Pinxit. Thomson’s son, William, alleged that it was ‘at my Father’s suggestion’ that Nasmyth had ‘consented to its being touched upon and finished by Sir Henry Raeburn’. These accounts of course agree with the modified inscription on the verso of NPG 46 and the portrait was duly catalogued between 1859 and 1866 as by Nasmyth and Raeburn. But the participation of Raeburn seems unlikely or irrelevant, as Scharf in 1889, Gray in 1894 and Skinner in 1963 made clear. It would do him no credit, but it cannot be disproved (and since he died in July 1823, his intervention would also bear on the date). Nasmyth’s portrait became the standard image of Burns and copies abound. Nasmyth himself produced a whole-length variant in 1827-28. An apparently contemporary version, allegedly descended from the poet’s mother (known as the Swinton portrait), now belongs to the University of Edinburgh. David Allan’s drawing of The Cottar’s Saturday Night of 1795 (National Gallery of Scotland, D 961) included an adaptation of the Nasmyth head which was much admired as an incidental likeness. Skirving, who never met Burns, made an attractive red-chalk copy of the head (Scottish National Portrait Gallery, PG 745) which was elaborated in an engraving by Paton Thomson in 1798. After Burns’s death the portrait was constantly engraved for successive editions of his works, the more important plates being by Edward Mitchell, Paton Thomson 1805, and William Walker and Samuel Cousins 1830 (this last particularly admired by Nasmyth, who thought it ‘more true & lively remembrance’ than his own painting). Such prints facilitated duplication by painters who included the artist’s daughter Margaret Nasmyth, John Cowan, Henry Harwood, John Gilfillan and Stewart Wilson. 1) To George Thomson, May 1795 (Burns Corr. 1987, pp 673-74). Much later the artist’s son, James Nasmyth (1808-90), an erratic source, alleged that the portrait ‘was rapidly painted. It was done in the course of a few hours’ (S. Smiles ed., James Nasmyth’s Autobiography, 1883, p 33). 2) William Hall, letter in the Kelso Chronicle, 29 January 1892. 3) B. Skinner, Burns: Authentic Likenesses, 1963, p 14. Burns to John Ballantyne, 24 February 1787, and to the Rev Hugh Blair, 3 May 1787 (Burns Corr. 1987, 114, 288). 4) Gilbert Burns to George Thomson, 2 July 1821 (J. C. Hadden, George Thomson, friend of Burns; Life and Correspondence, 1898, pp 379-80). Beugo’s plate was reversed by the Irish engraver Patrick Halpen for the pirated Dublin edition of Burns Poems 1787 (illus. Mackay, Burnsiana, 1988, p 21). 5) James Nasmyth to George Scharf, 18 May 1872 (NPG archive). 6) Thomson to Stothard, 7 October 1821 (National Library of Scotland, MS 685 f.20, kindly communicated by Helen Smailes); Thomson specifically told Stothard the loan would ‘afford you an opportunity of copying the likeness’ for the Parnassus ceiling in the Advocates Library in Edinburgh. Was this the loan which James Nasmyth, often unreliable in his reminiscences, associated with a Burns Dinner? A drawing by Flaxman from the Nasmyth head was sold at Christi's, Edinburgh, 1 November 2001, lot 8. 7) Who painted an undated (but late), half-length of Thomson, now in a private collection. 8) To Robert Chambers, August 1850 (J. C. Hadden, George Thomson, friend of Burns; Life and Correspondence, 1898, p 135). 9) William Thomson to John Scott of Colnaghi, 23 July 1851 (NPG archive). 10) From 1859-1866, in the 2nd-4th editions of the NPG cat., it was called Nasmyth and Raeburn; the 5th edition of 1881 omitted Raeburn’s name. In 1889 Scharf explained that ‘about 1872, a communication was received from Mr James Nasmyth, expressing his full conviction that Sir Henry Raeburn had no part in the portrait’ and Raeburn’s name was accordingly withdrawn (Notes and Queries, 7/VIII, 1889, p 422; Nasmyth’s assertion, which would be of limited academic worth, has not survived). In 1869 NPG 46 had been described as “a sort of a kind of a replica ‘painted for George Thomson, and retouched by Sir Henry Raeburn’, as the catalogue has it, but I should guess it to have been executed by Nasmyth after the poet’s death, and without the original portrait before him” (‘Chitteldrog’, Notes and Queries, 4/IV, 1869, p 318). 11) G. Scharf, Notes and Queries, 7/VIII, 1889, pp 422, 482. J. M. Gray, Magazine of Art, XVII, 1893-94, p 240; B. Skinner, Burns: Authentic Likenesses, 1963, p 12, considered that ‘the evidence of the painting itself contradicts completely the implications of the pen-and-ink inscription’. 12) See J. Grieg, Raeburn, 1911, p XXVI, citing letters from Raeburn to Cadell & Davies, dated between 14 November 1803 and 22 February 1804. 13) J. M. Gray to G. Scharf, 1 December 1892 (NPG archive). See also J. Mackay, Burnsiana, 1988, p 18. 14) J. H. Burnett et al., University Portraits, second series, Edinburgh 1986, pp 31-32; see also G. G. Neill Wright, Burns Chronicle, 3rd ser., V, 1956, f.p.17. 15) Illus. Magazine of Art, XVII, 1893-94, p 243, with detail of the boy’s head; see also Burns Corr. 1987, p 673; one of a series of pictures commissioned by George Thomson to illustrate his Scotish Airs. 16) Once in the collection of the engineer George Rennie, who considered it the ‘the most beautiful thing I ever saw’ (J. P. Muirhead, Mechanical Inventions of James Watt, 1854, II, p 366); Walter Scott called it ‘the only good portrait of Burns’. See Richard's Rival, Archibald Skirving, Scottish NPG, 1999, no.103, pl.19. 17) S. Smiles ed., James Nasmyth’s Autobiography, 1883, p 33. J. C. B. Cooksey, Alexander Nasmyth, 1991, pp 62-63 (N7). B. Skinner, Burns: Authentic Likenesses, 1963, pp 7, 13. Dark brown hair, brown eyes, wearing a dark green coat, grey waistcoat and white neckcloth. George Thomson (1757-1851); his son William Thomson1 who sold it c.1851, through John Scott of Colnaghi, to John Dillon, by whom presented 1858. 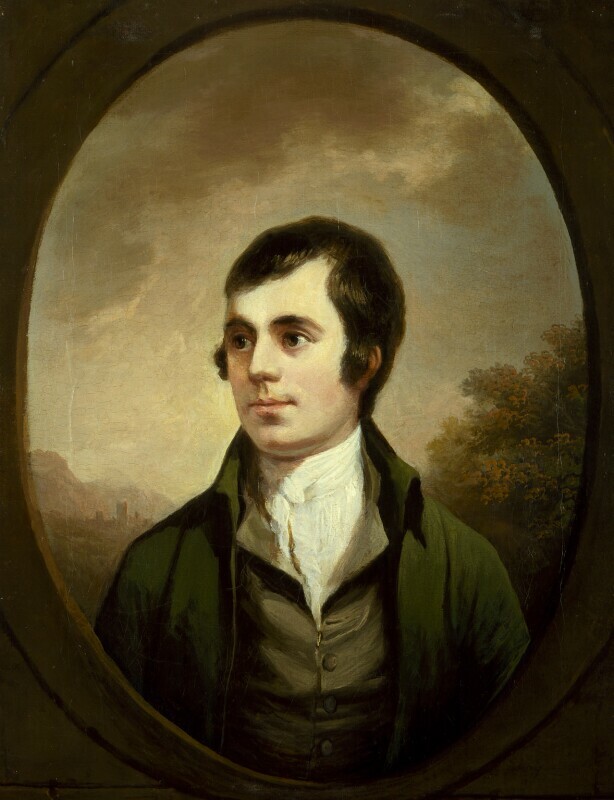 1 On 17 June 1851 he wrote to the Edinburgh bookseller W. F. Watson concerning the sale of his ‘Portrait of Burns, painted jointly by Nasmyth and Sir Henry Raeburn’ (National Library of Scotland, MS 587, ff.16-17). Burns, Glasgow, 1896 (15); Thomas Carlyle, NPG, 1982 (59); Kenwood, Regency Portraits, 1986; Romantic Icons, Dove Cottage, the Wordsworth Museum, Grasmere, 1999 (22).